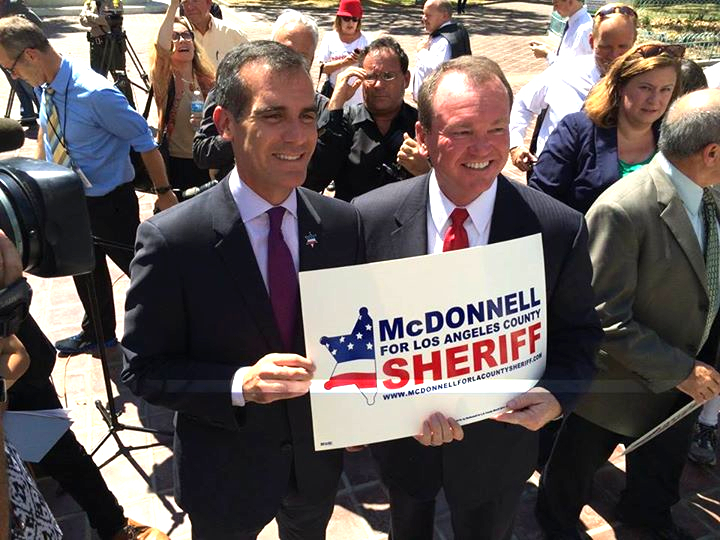 Mayor Eric Garcetti and L.A. County sheriff candidate Jim McDonnell pose outside City Hall. At a press conference outside City Hall, Los Angeles Mayor Eric Garcetti on Tuesday announced his endorsement of Long Beach Police Chief Jim McDonnell in the race for L.A. County sheriff. McDonnell, former second-in-command at the LAPD, is in a November runoff with former Undersheriff Paul Tanaka. “Chief McDonnell and Mayor Garcetti have been long-time partners in reducing crime, increasing public safety in the region and advancing smarter approaches to policing, including investing in reducing crime by improving opportunities and protecting the most vulnerable, instituting strong management teams and practices, and focusing on results,” Becca Doten of McDonnell’s campaign said in a statement. In the June primary, McDonnell received 49 percent of the vote and Tanaka was second with 15 percent. McDonnell did not get enough votes to avoid a runoff, but has received endorsements from four of the five losing candidates as well as several elected officials and law enforcement groups. The Los Angeles Times, which endorsed McDonnell in the primary, on Thursday urged voters to support him in the general election. Tanaka continues to appear in public as mayor of Gardena, but as a candidate he has posted only one message on Facebook and Twitter since the primary and there are no recent news items or events on his campaign website. In June, Tanaka was called as a witness in the trial of six sheriff’s deputies charged with interfering with a federal investigation of deputy-on-inmate abuse in the county jails by keeping an FBI informant hidden within the system. The defense argued that the deputies were acting under orders from Tanaka and then-Sheriff Lee Baca.